Before we delve into the value Key Performance Indicators (KPI's) offer to an Inbound Marketing program, let's first drill into the sources of the website traffic and the value that content plays. 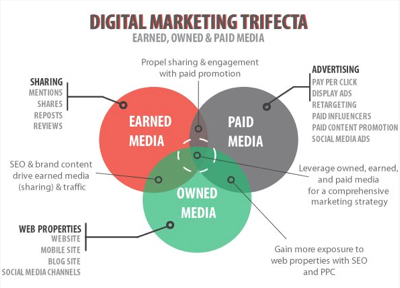 Website traffic can be broken down into three categories, owned, paid and earned media. I love this depiction of the three types of website traffic sources because it provides context for the way marketing teams should determine if their tactics are balanced. An important detail not to be missed is the understanding that quality website content is the fuel that powers visitor engagement for all three categories. Content improves organic SEO, forms the discussion for social engagement and is the landing spot for paid media. Please keep in mind that in order to measure the 9 KPIs for Inbound Marketing success, you need the inbound marketing tools with the analytics to provide you with the proper metrics. In a digital world, your website is the most important investment you can make because it is the landing place for your Earned and Paid media investments. Search Engine Optimization (SEO) is the primary method to attract organic traffic to your website. However with the vast amount of content that is available on the web, it is critical that the content you provide targeted to your primary buyer. The content should adhere to the best practices of the buyers journey stages by offering valuable information while offering content that leads them to the next journey stage down the marketing pipeline. Assuming the website static pages are optimized, the most valuable tool for improving SEO and maintaining website traffic is an active blog. 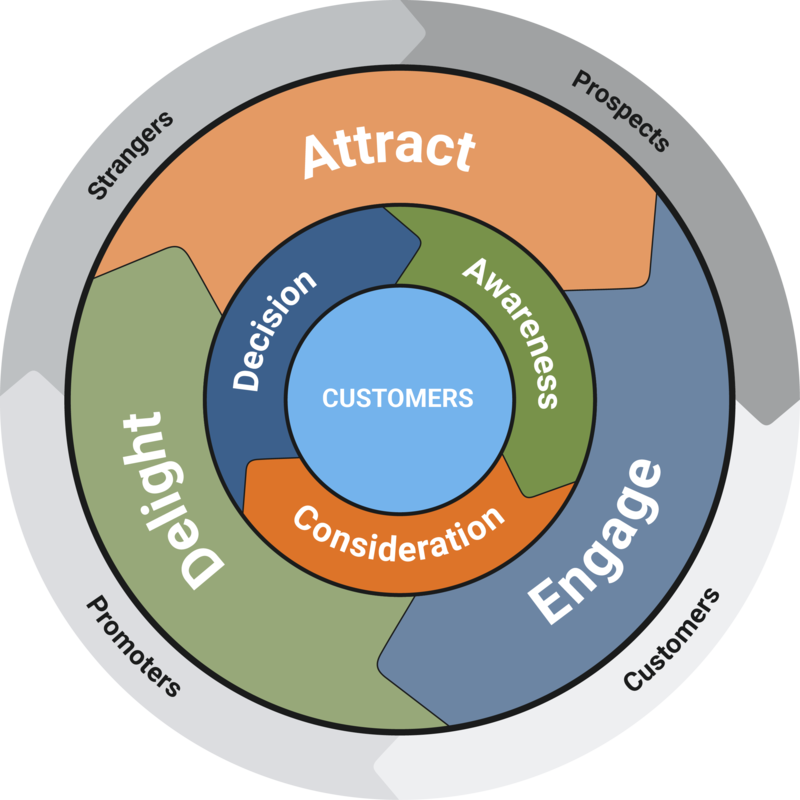 Blogs provide content at the very top of the marketing funnel, called the Awareness stage of the buyer's journey. Active blogging helps to increase the value of your owned media because they generate 55% more website visitors and when paired with premium content offers they convert 126% more of the visitors into leads. Search engines penalize websites when visitors immediately bounce away from the site (often called pogo sticking), well-written articles ensure that the visitor spends more time on your site. 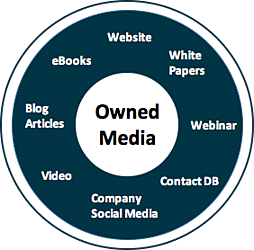 Owned media sites are the destination (your website) then the best way to think about earned media is the vehicle that helps people get to your site. 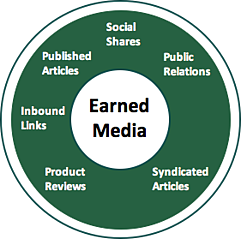 Historically, the SEO version of earned media are inbound links from other authoritative websites. Now it also includes all types of social media. Since social media has become the prominent way for on-line visitors to interact with your brand, having an active social media presence helps drive traffic to your website. Don't forget the continued importance of inbound links have on generating traffic. By syndicating your content on third party authoritative web sites, on-line magazines, partner sites, and others, the site search engine rank will improve significantly as will the organic traffic as a result. My favorite methodology for on-line advertisement is called "Retargeting." This method either targets advertisements to people who previously visited your website or are based on a targeted list of contacts from an organically generated or purchased contact list. 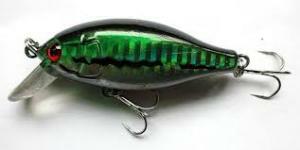 If you have ever shopped on a website for a product, and then later while visiting another site you see an advertisement for the very same product, then you have been the recipient of retargeting advertisements. The reason I like them so much is that they are another method of lead nurturing which has been shown to increase conversion rates to customers by 20% over non-nurtured leads. Regardless if your brand is seeking earned or paid media, shared premium content is the lure that attracts visitors to your website. Each campaign you execute to generate traffic may not produce results since your campaigns are competing with millions of others on the internet therefore you need to measure the impact of each. Businesses need metrics of how each prospect engages your website to have enough data to make informed decisions. and finally those who convert into Customers. The metrics at each of these five process steps and the conversion ratios between each step form the basis for the 9 Inbound Marketing KPIs. The number of visitors to your website is the easiest metric to measure. Google Analytics provides this information readily. Since visitors have not yet completed a form on your website, it is not readily possible to segment the visitors into the specific buyer personas. Marketing tools like Hubspot enable the identification of historical behavior from first visit once the visitor converts into a lead, and you know who they are. This data is helpful because analytics provides insight into the source of the first contact with each and every lead. The visitor to lead percentage and the total number of leads are an important measure of the quality of the Awareness stage content on your website AND the effectiveness of the initiatives to increase relevant traffic from the three media sources described at the beginning of this article. Inbound Marketing specialists are experts at Conversion Rate Optimization (CRO) by analyzing the analytics and making subtle changes to landing pages, content, social and advertising campaigns. Conversions for Awareness stage material gives your business the contact information you need to nurture these leads into opportunities. 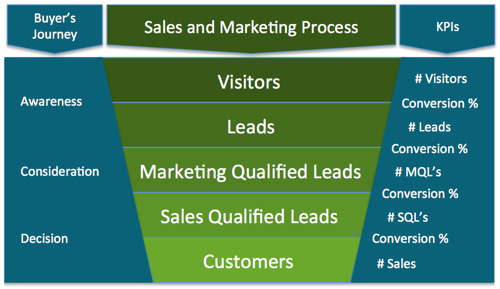 Lead nurturing enhances the conversion rates at each stage of the marketing funnel. Since 50% of traditional leads are qualified but not ready to buy and without lead nurturing 79% of leads never convert into sales, nurturing significantly improves conversion rates and improves the return on the investment of website traffic generation methods. The leads at this stage are awareness stage leads. So what is the difference between a lead and marketing qualified lead? The key here is this prospect has converted on a "brand filter" offer. That means that the offer clearly indicates that the offer is about your business, product or services. These Consideration buyers journey stage leads have educated themselves at the awareness level and are now researching your company. By selecting to download this offer, the visitor is "considering" working with your company, products or services. The creativity of the offer and the alignment of the nurturing emails for the target persona impact the conversion rate. 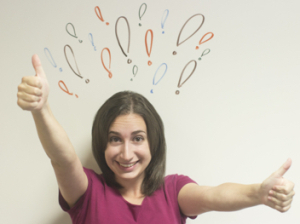 Your business has several ways you like to engage with prospects. Perhaps it is an assessment or a technology review or some other high-value offer that causes qualified candidates who have already researched your company to raise their hand to engage with your sales team. 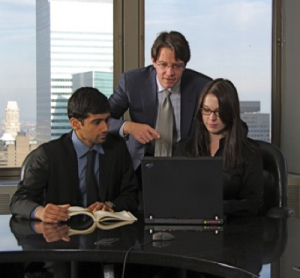 These prospects are truly qualified and ready for sales to further qualify the ability of the prospect to buy, budget and management support for a purchase. Ensuring there are several, decision stage offers that have a high perceived value, impacts the conversion rate from MQLs to SQLs. Most businesses have analytics about the conversion of opportunities into customers. The conversion rate varies from sales representative effectiveness and the quality of the prospects themselves. When this methodology is followed and optimized, then the conversion rate from an opportunity to customers increases because the prospects have completed most of the buyers journey before engaging with sales. Statistics has shown that email nurtured leads generate 20% more sales than those who have not been nurtured. 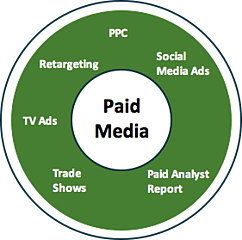 The conclusion is all forms of traffic - organic - social - paid are required for Inbound Marketing success. Content that enables the buyers journey for a particular Buyer Persona (target prospect) produces better conversion rates. It is important to maintain metrics by persona as Inbound Marketing programs mature at your company. Leveraging the 9 KPIs provides clarity into where the marketing funnel needs improvement. Start by ensuring the traffic generation initiatives are balanced and target the buyer persona.